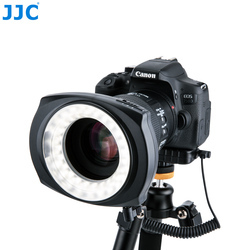 Home › Flashes & Accessories › Macro & Ring Lights › JJC LED Flash Camera .. This lighting unit provides a continuous lighting (not flashing) and it still low temperature even using continuously as the LEDs are low temperature luminary. The continuous lighting also let you easy to handle exposure, allows for more effective lighting of subject during macro shooting. 4 )SERVICE TRANSIT TIME is provided by the carrier and excludes weekends and holidays. Transit times may vary, particularly during the holiday season. 6) We would like to remind that the import duties,taxes or additional charge brought by your local customs will be responsible for buyers.For further details,you may consult to your local customs before purchasing the products. 7) We also provide UPS,DHL faster shipping way in case you need the goods urgently.Please select the proper shipping way before purchasing the products. 1) All products sold on JJC Official Store are guaranteed for ONE FULL YEAR against defects in workmanship and material. 2)You have 7 days to contact us and 30 days to return it from the date it was received.Buyer shall clearly descript the defective with full information by email.If necessary a video and link to us to show the defective. 3)If this item is in your possession more than 7 days, it is considered used and WE WILL NOT ISSUE YOU A REFUND OR REPLACEMENT. There are NO EXCEPTIONS! Shipping cost is bear by both seller and buyer in half. 4) All returned items MUST BE in the original packaging and you MUST PROVIDE us with the shipping tracking number, specific reason for the return, and your po#. We believe that best quality and top-class company originate from profession and service.